Jamie here to share a birthday treat with you! 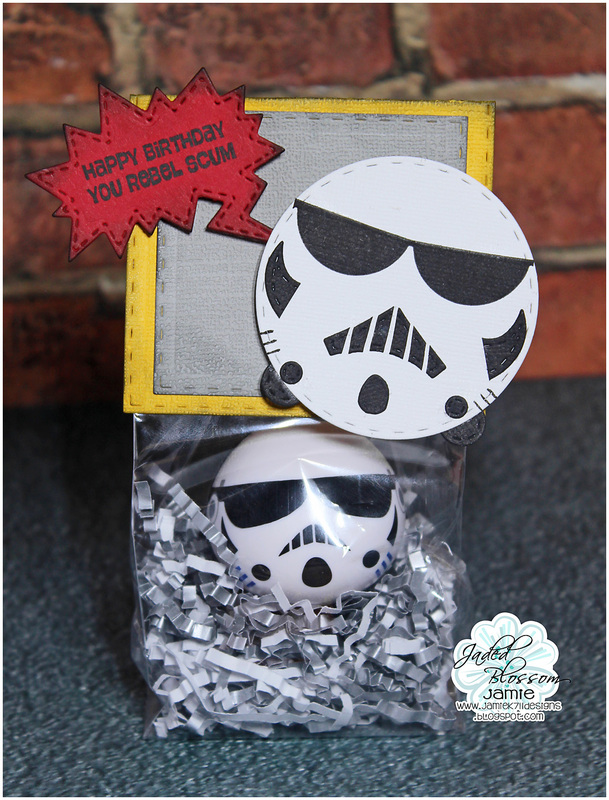 I created a Tsum Tsum Stormtrooper with a few dies! I started with Stitched Circle Dies, I used Word Bubble Dies and Mini Tag Dies 3 for the mouth, cheeks and circles. The eyes I created with Banner Die. I also used Snowman Dies and Christmas Dies on the face. I stamped a sentiment from Candy Wars to a Word Bubble Die and added it to a topper created with Rectangle Dies 1 and 2. I added the topper to a Gusset Bag with a Lip Smacker Storm Trooper! This is Awesome, loove it!!! !